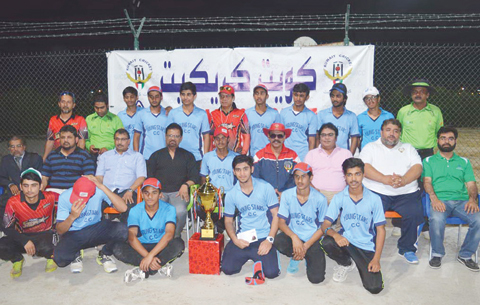 KUWAIT: The finals of Kuwait Cricket U-19 Tournament, organized by Kuwait Cricket, was played between Future Star XI and Junior Young Star at Sulaibiya Turf Cricket Ground on Saturday the 4th of June at 4:30 PM. Young Star Cricket Club won the toss and elected to bowl on a pitch that looked conducive to batting. The weather very hot and humid, certainly not the weather in which the cricketers would enjoy playing on it, even the temperature of 45 degrees and above could not stop these young enthusiasts of cricket or hamper their enthusiasm in exhibiting their talent in this scorching heat. Future stars started their innings cautiously but in the second over lost their opener Abdul Rahman, bowled by Hamza and in the last over of the power play Abdul Sadiq had to return to the pavilion at his personal score of 18, hence by the end of power play Future Stars put on a score of 39 for the loss of two wickets. A 48 run partnership between Hamoud and Haseeb with some gritty hitting from the bat of Hamoud, who scored 41 with three sixes and three hits to the boundary put some good score of 91 runs in 11 overs for the Future Stars. Haseeb scored his 50 with some good hitting in the penultimate over of the innings and was the highlight of the future star innings to get to a respectable total to defend. Young stars bowlers got the important breakthrough regularly, which put the brakes on to the batting of Future Stars, who at one stage looked like scoring above 200 runs, but some good overs and wickets at regular intervals pressurized the future star batsmen to be on their back foot. Future managed to post a total of 154 for the loss of 7 wickets in the stipulated 20 overs. For young cricketers Fiyaz was the pick of the bowlers with 2-13 in two overs while their disciplined bowling attack controlled the intentions the dangerous looking Future Star batting effort. Junior Young Stars started their chase sensibly without losing a wicket in the powerplay, they put on 43 runs in the powerplay by picking up sharp singles and doubles and their running between the wickets was exceptional. At the half stage of the chase, after 10 overs the Junior Young Stars had managed to score 65 for the loss of one wicket, thus requiring another 100 runs to win from 60 balls. Good partnerships helped to ease the chase for Junior Young Stars, 46 runs for the first wicket and another exhibition of excellent second wicket partnership of over hundred runs kept on the score board moving and making the target look easier and within their reach convincingly. Ahmed Hafeez scored unbeaten 65 runs in 33 balls with 7 fours and 3 sixes and Anas scored his 50 in 41 balls with 6 boundaries and 1 six mastered the chase with some good and sensible batting to chase down the target and win with 8 wickets emphatically in the 18th over. Ahmed Hafeez for his useful contribution with the bat in taking his team to win the title was declared Man of the Finals. The dignitaries present at the finals to encourage the young lads were Director General Kuwait Cricket Asad Baig, Vice Chairman Iqbal Vanoo, Director, Coaching Panel, Samer Desai, Director Women’s Cricket Mahboob Khan, Director Match Officials, Imran Mustafa, Irfan Adil and Tahir Khan too were present at the post match presentation, encouraging the young boys for their excellent sportsmanship. The post match presentation was conducted by Syed Nadeem and the final vote of thanks was delivered by Iqbal Vinoo for both the teams and the supporters of the game.